In addition to our exciting fitness classes, delicious bakery treats, and fascinating shops, Hawley Silk Mill hosts a variety of events throughout the year. From art festivals to immersive cooking classes, you’ll always find something new and fun to experience at our lifestyle center. Here are just some of the most popular annual events at Hawley Silk Mill that you’ll want to add to your calendar immediately. While you’re enjoying the annual events at Hawley Silk Mill, be sure to explore the other activities we have available. You can view local art in the Looking Glass Gallery, grab a tasty and fresh-baked snack from Cocoon Coffee House and Bakery, or browse for souvenirs in our variety of shops. The options are nearly endless! If you’re looking to sharpen your cooking skills or learn how to make a new dish that will impress your guests, look no further than Hawley Silk Mill’s cooking classes. These classes are offered throughout the year and provide a great opportunity to prepare delicious food and desserts while meeting new and interesting people. You’ll be taught by professional pastry chef, Julia Kent, and even be treated to tasty cocktails and other beverages during the class. Yum! On May 12th, 2019, be sure you’re here to enjoy our There’s No One Butter Than You Mom cooking class. This special Mother’s Day event will teach you how to create a mouth-watering brunch while you and Mom indulge in a complimentary mimosa! As a part of Wally Lake Fest, the Artisan Craft Fair is your opportunity to indulge in some retail therapy. The open-air market offers visitors a wide range of products created by local artisans. You’ll also find local food, free tastings, and a cocktail ice bar. After shopping at the market, be sure to enjoy the festival’s other exciting activities such as the boat parade, music on the lake, and the pancake breakfasts. Meet up-and-coming artists and shop for locally-crafted products at the popular Hawley Winterfest event! The market is hosted at Hawley Silk Mill each year, but don’t forget to check out the other fun-filled activities that will be taking place all over town including the annual cookie walk, snow tube rides, or the holiday house tour. This is one of the most highly-anticipated Hawley Silk Mill events each year! 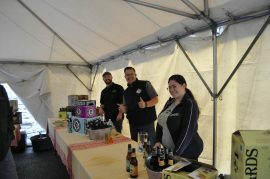 Stop by for local and regional beer tastings and traditional Oktoberfest fare. In addition to the Rocktoberfest activities, we invite you to explore our unique lifestyle center. You’ll find plenty of things to do including shopping, exploring an art gallery and refueling at Cocoon Coffee House and Bakery! From Caribbean-inspired cuisine to flavorful Asian dishes, you’ll be sure to enjoy an incredible meal during one of our pop-up restaurant events. Meals are enjoyed in the Boiler Room of Hawley Silk Mill and offer diners a unique culinary experience that is sure to delight the taste buds. Dates for pop-up restaurants are frequently added to our calendar, so be sure to check back often. Hawley Silk Mill has been a vital part of this community since its construction in 1880. Its many uses over the years have included a silk factory, a textile factory, and antique center. Never has it been more vibrant than today. The vision for the repurposed factory is to serve as a center that celebrates the lifestyle of the Pocono Lake Region – a place for the residents and visitors alike to shop, gather, eat, exercise, and learn. We can’t wait to welcome you soon!